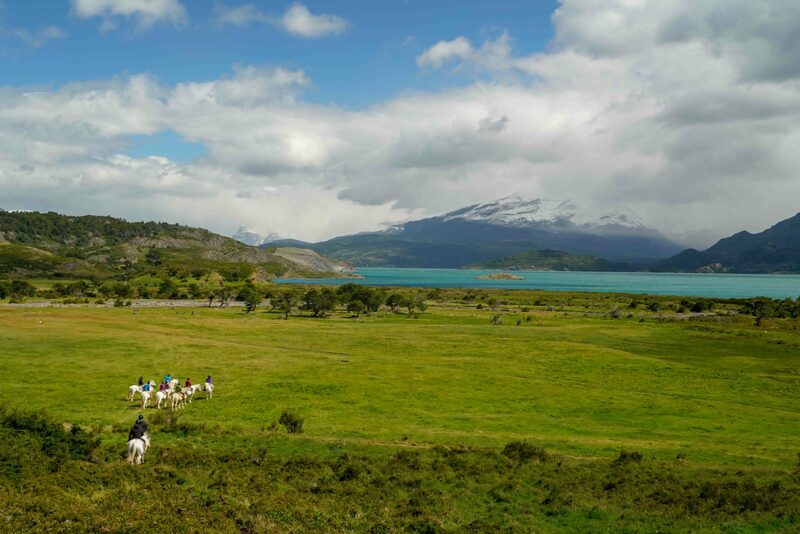 One of Patagonia’s most enduring legacies is the estancia: vast estates of pampas (hilly grasslands) populated by huge herds of sheep and a handful of baqueanos — Chilean cowboys — that, once a year, will travel on horseback over those thousands of miles to round up the sheep. The sheep are herded back to the main ranch (the casco central) where they’re sheared, harvesting their high-quality wool that in the past was shipped to Europe to clothe the wealthy, and then they’re released again for another year under the never-ending Patagonian skies. Estancia culture began in the region in the late 1800s when immigrants from Europe and the north of Patagonia (namely Chiloe) came to the far south. At first, the money was in the exportation of wool, particularly of the silky-smooth, luxurious Merino variety, but then shifted to selling meat when refrigeration systems were invented. The introduction of sheep to the wide-open fields of Patagonia and the establishment of the estancia system profoundly changed the natural, cultural, and economic landscape of the territory: altering habitats, uprooting native species, and bringing wealth to the region. Today, many estancias are still operational but many have also downsized or adapted to the times to make ends meet and to make amends of the environmental damage done in the past. One of these estancias — which has given the majority of its 19,000 acres back the native wildlife (only 2,600 acres are used for livestock), significantly diminished its herd size from the traditional tens of thousands to a mere 1,300, and created opportunities for tourists to visit and learn more about the estancia lifestyle — is Estancia La Peninsula, located on the wind-battered shores of Last Hope Sound in Chilean Patagonia. The winds in this part of the world are notorious and brutal foes, and everything here has to work around them, including my schedule. My day trip to the estancia, which is only accessible by boat, had been canceled earlier in the week because the winds were too strong to head up into the sound by boat. The winds (“westerlies”) blow so hard, so strong, and for so long here that if the boat captain doesn’t feel it’s safe, then it’s a no go. So when there is bad weather, Estancia La Peninsula, on its rocky shore further up the fjord, is completely isolated and cut off from the outside world. There’s a certain romanticism and appeal in that. The winds I can live without: go outside for a minute and my face is blasted raw and chilled to the bone. But no matter: my trip had been rescheduled for later in the week and the day has finally arrived. It dawns crisp and clear: about as perfect a day as it’s possible to have in Puerto Natales. The water of the channel is a mirror-like cerulean blue, gently lapping at the shores. The sun shines down, warming the dock that I stand on as I wait to board the boat that will take me to the estancia. On the horizon I can see snow-capped mountains. The day is gorgeous; utter perfection. Our group — a family on holiday, a couple, a volunteer who would be living at the estancia for the next week, and me, the perennial solo traveler — board the boat and we set off. On the way our guide points out different landmarks, like an island where guanacos could once been spotted, which served as a marker for sailors back in the day. 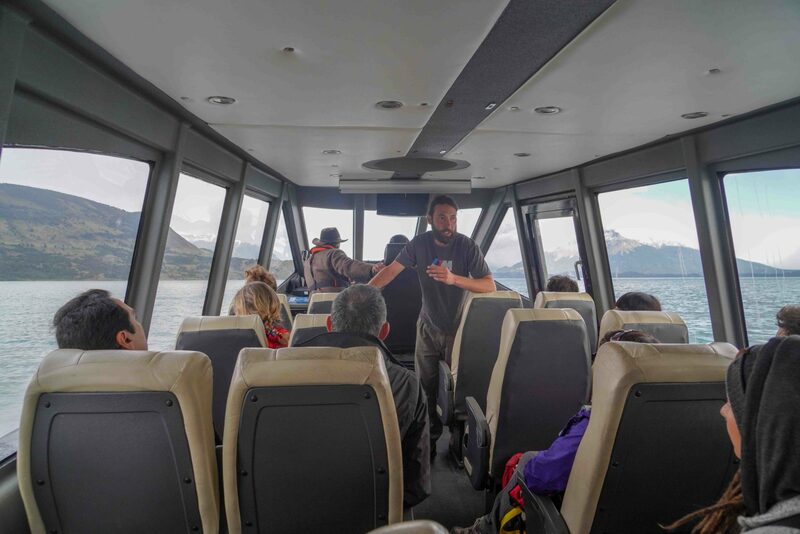 As we motor further into the fjords, the landscape on shore starts changing from undulating Patagonia grassland to large, rocky hills, and in front of the boat we can see the snowy mountains we’d seen from town getting closer and bigger. A pair of curious dolphins briefly swims alongside the boat. And finally, on the far shore, we glimpse a small cluster of red buildings with the dock sticking out into the water: Estancia La Peninsula. Estancia La Peninsula was founded in the late 1800s by the prominent MacLean family, but they’ve changed their model by incorporating tourism into their activities; to do so, they allocated the majority of their land for conservation purposes and created hiking and horseback riding trails for visitors to explore the estancia’s lands. Their herd now only consists of Merino sheep, which produces an extremely high-quality wool. This subspecies of sheep were originally from Spain but the modern variety as we know it today was domesticated in Australia and New Zealand. 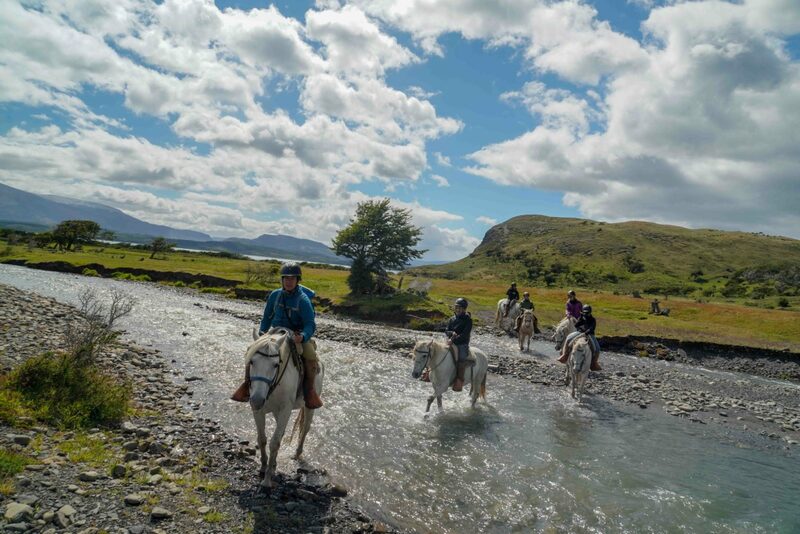 But while some things have changed, many aspects of life on the estancia are just as they were in the past: the training and use of Magellanic sheepdogs, riding and using Criollo white horses, hiring local baqueanos (or gauchos as they are also sometimes called), and using traditional gear. After disembarking, our group is lead to the main estancia house: a modern building decked out in traditional ranch decor, with large windows that look out on the water and mountains. We’re served fresh coffee and warm Mapuche sopaipillas while the group gets to know each other a bit better: we all come from all over and it’s so nice to meet new people and hear their stories while on the road. After depositing our things, we’re led to the tack building a short walk away to meet our horses and gear up. On the walk there, we encounter an adorable calf being fed from a bottle by a ranch hand; we’re told that the calf lost its mother and now it’s being taken care of here on the estancia itself. But my attention is drawn to the white, stately horses that await us. 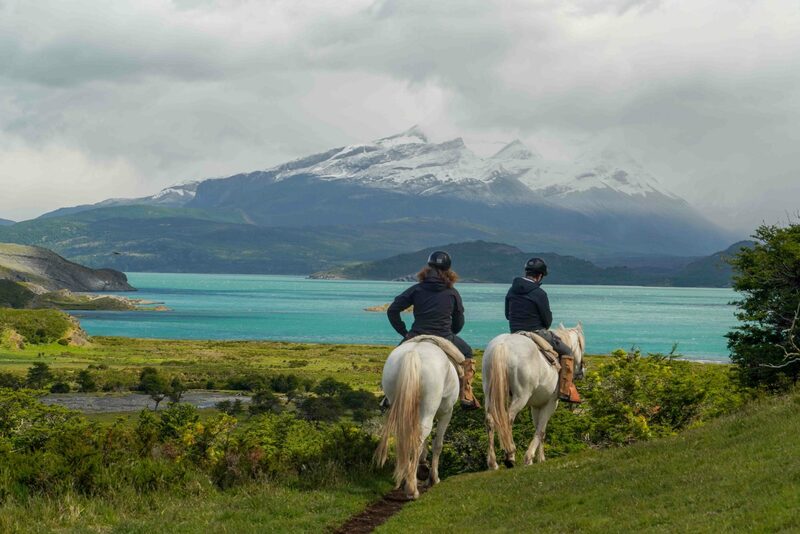 The horses used here on the estancia are all older, having been bought from different estancias and brought here for an easy retirement of leisurely rides with tourists and galloping over wide, open fields. After getting into our gear, we’re each helped onto our respective horse. Since I have some background in horseback riding, I’m given one of the more headstrong horses, and boy does he let me know it. Immediately he’s trying to see what he can get away with: dipping his head to eat grass, not responding to my slight kicks and signals to turn or stop. The gauchos tell us that right away the horses will be testing us to determine whether they respect us or not, so it’s important to be firm and strong with the horse to show them who’s the boss, who is the one in charge. So I keep a steady grip on the reins and endeavor to be forceful with this stubborn horse who does not want to cooperate. After everyone is saddled up and has gotten more comfortable with their horses in the paddock, we’re led out along a trail, with the mountains to our left and the water to our right. My horse still strains at the reins and is constantly trying to break into a trot or gallop but I keep him walking slow so I can appreciate the stunning landscapes, the fresh air and sunshine, and chat with my other riders. The path passes through a part of the ranch where there are many different kinds of sea and land birds, as well as hares. After walking along the shore for a while, we start to walk up into the hills and enter a forest of stunted trees that have been shaped by the wind. The horse deftly navigate a muddy track along steep hillsides but never falter. Finally, the track evens out and then tops a final crest to a windy hilltop overlooking the ranch, the channels, and the mountains. It’s one of the best views I’ve ever seen in my life. After stopping a few minutes to take in the view and take pictures, we go down the other side of the hills to the shore, where we stop by an exposed bank. Here, we’re told, archeologists found evidence of native tribes having lived, fished, and gathered food; there are also several caves further inland, which can be reached on a two-day trek, where other artifacts from tribes were found. Then we turn around and return along the shore, crossing small streams, watching birds take off, and soaking up the sunshine. At a few wide stretches along the way, I let my horse break into a trot to blow off some steam and enjoy the ride. It seems that now, finally, as our time together is drawing to a close, me and my horse have reached an agreement of respect. He is better responding to my signals and instructions and in so doing I feel that he has deemed me worthy. It’s a good feeling, and I’ve thoroughly enjoyed being challenged and put to the test. After getting off our horses and turning them over to the gauchos so they can go enjoy the rest of their afternoon free of work, we go back to the main house to get cleaned up and wait for what’s coming next: an authentic Patagonian asado (barbecue). 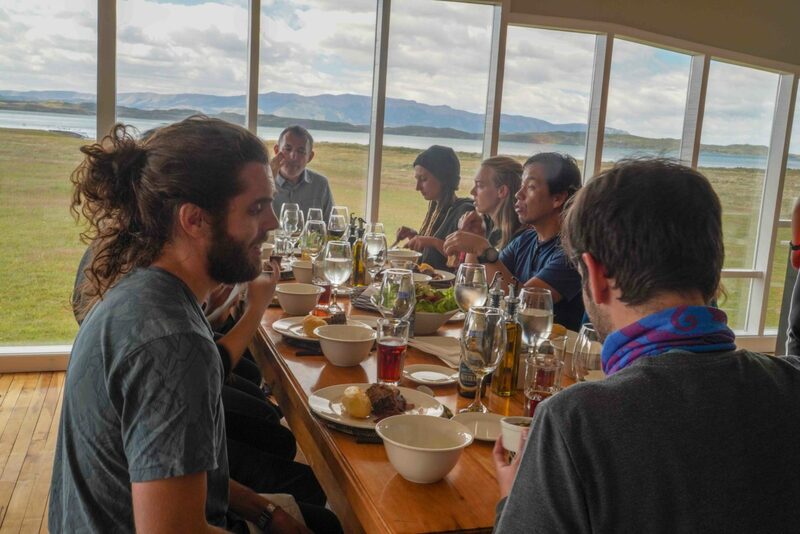 A traditional asado in Patagonia uses lamb, which, after being killed and skinned, is butterflied over hot coals and cooked in the simmering heat until the meat is lusciously tender. We’d seen our lunch roasting earlier and now the lamb had been moved to the barbecue pit in front of the main house so we could watch it being taken off and cut up. But while we wait, we’re given cold local beers and sit out on the deck in the sunshine. The wind rustles the grass. People talk and laugh all around me. I listen to the waters of the channel gently crashing on the shores nearby. The cold beer in my hand tastes like heaven. This is what pure happiness feels like. The lamb is then taken down and cut up, and we go inside for a Patagonian feast: lamb, baked potatoes, salad, and red wine. Everything tastes delicious and out the windows we watch the horses going back out to pasture. I stuff myself and liberally enjoy the wine, ending the meal in a content daze. But there’s no time for relaxation: there’s still more to come. Outside, a small herd of sheep is directed by a pair of sheepdogs to demonstrate their skill and agility to us. It’s truly amazing how smart and well-trained they are: the dogs respond to a wide variety of commands quickly and easily, making the sheep go in circles or break into smaller groups. Although one, the estancia workers laugh and tell us, is a little slow and awkward but his heart is in the right place! We all laugh and agree that he’s a very good boy, indeed. Then we walk to a nearby barn where our guide tells us about sheep shearing on the estancia. Large piles of Merino wool are stacked in the corners and we run our fingers through the earthy-smelling, soft ringlets. Then we’re shown the different cutting tools used for shearing and how the barn is set up: sheep waiting to be sheared are kept in an enclosed area out back before being led through a wooden, enclosed walkway to the shearing station. When done, they go through another door and are released into a fenced-in field behind the barn to be monitored and adjust to the feeling of not having their full coat. We’re told that master shearers can get through a sheep in a matter of minutes, and that, while some estancia staff know how to shear the sheep, the true experts are nomad shearers, who, during shearing season, spend months at a time on the road going from estancia to estancia shearing their herds. To demonstrate, a sheep is brought in and the shearer shows us the correct pattern and method for shearing. The sheep struggles and kicks, so it shows true skill that a good shearer can go through perhaps hundreds of frightened sheep in a day and not cut them or damage the wool. The day is almost at an end; we’ll need to get back on the boat soon to go back to the mainland. But there’s one last surprise first: a cute and fluffy surprise. We follow the staff up a short hill, and as the top comes into view, so does a small group of adorable sheepdog puppies and a young lamb, running toward us. Everyone in our group instantly collapses into squeals of delight and “awwww’s!” and drops to the ground to cuddle and pet them. The next half an hour goes by in a blur of puppy kisses, little lamb bleats, and pure joy. But then it’s time to go. After a final coffee and saying goodbye to those that are staying on the estancia for the night, we board the boat and start back. 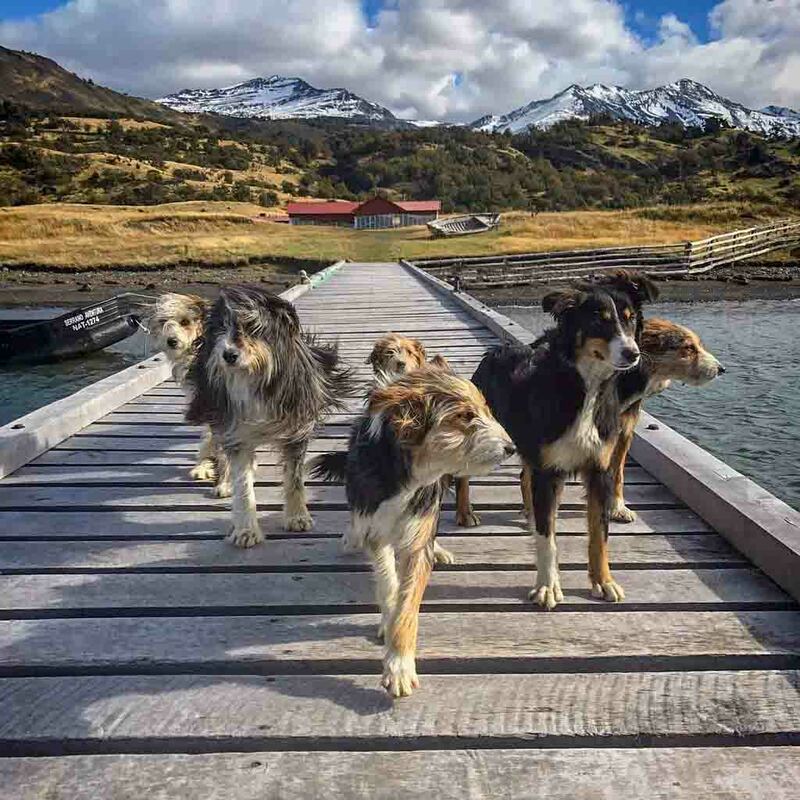 What a wonderful day: I learned all about life on an estancia in Patagonia, got to see some absolutely stunning landscapes, earned the respect of a steadfast horse, had scrumptious food and drink, and got to play with puppies and lambs. Already I find myself looking forward to a future visit to Estancia La Peninsula, and once again getting swept up in the estancia life.